GRAIN growers in southern Australia’s high rainfall zone (HRZ) have the potential to increase their wheat and canola yields by an average of 50 per cent, according to yield modelling. Through the Grains Research and Development Corporation’s (GRDC) ‘Optimising the yield and economic potential of high input cropping systems in the HRZ’ investment, researchers are developing new knowledge, tools, resources and recommendations to push yields and improve grower profitability. Agriculture Victoria Hamilton-based senior research scientist, Penny Riffkin, said the project had three main components, outputs from which would enhance understanding of crop physiology in order to identify crop types better suited to the HRZ and also inform growers’ tactical decision-making in their quest to bridge the yield gap. “The first component is focusing on ideal wheat types that are better suited to this region, in terms of phenology and canopy architecture,” Ms Riffkin said. “It could be that putting on more nutrients will give you a 30 percent yield increase, or in some cases it could even give you an 80 per cent yield increase, but it may not be economical to do so,” Ms Riffkin said. “The crop response will be limited by the nutrient which is most limited,” Ms Riffkin said. 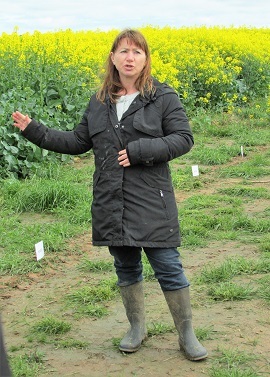 “Growers can input their location, their crop type, the expected water limited yield of those crops, input costs and product price, plus there is also the provision to adjust that information depending on evolving seasonal conditions,” Ms Riffkin said. The tools can be downloaded free of charge via the GRDC Communities website at goo.gl/ji99PB.